Riley Park – which for decades has been a highly stable neighborhood of middle class immigrants – is being gentrified as home buyers and business owners look for houses and stores that are more affordable than on the west side of Vancouver, but are still close to the downtown core. Riley Park sits right in the centre of Vancouver, extending from Cambie Street on the west to Fraser Street on the east, and from 41st Avenue on the south to 16th Avenue on the north. From Statistics Canada, 2011 Census, custom order for City of Vancouver Local Areas (comparative data for the Census Metro Area in parentheses). Loggers cleared the Little Mountain area – which is part of an extinct volcano and the highest point in the city, at 500 feet – in the late 19th century. Quarry workers mined the volcanic rock to surface the area’s first roads. 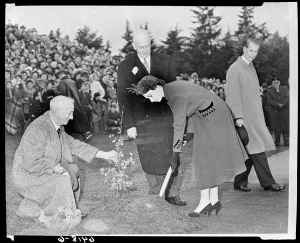 One of the quarries became the city’s first water reservoir, which was covered by a parking lot after Little Mountain became Queen Elizabeth Park in 1940. Mountain View Cemetery was established in 1886. 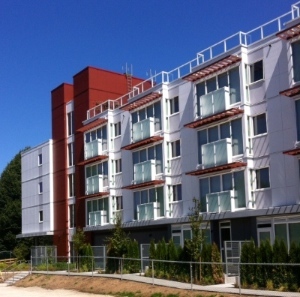 Last fall, seniors moved into 53 new independent living homes in More Than a Roof’s City Heights project. Social housing: Opened in 1954 as BC’s first social housing project, the Little Mountain townhouse complex (between 33rd and 37th, on Main Street, east of Queen Elizabeth Park) provided 224 affordable rental units to 600 tenants. 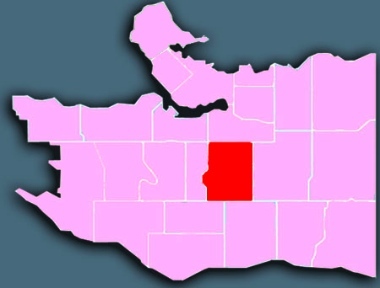 Bitter controversy erupted in 2007 when BC Housing sold the 15 acre property to a private developer to pay for onsite replacement of the social housing units and for 2,100 more in eight municipalities across the province. Many people insist the radically densified new development should include far more units than just replacement of the originals and that all the additional units should be constructed in Vancouver. They were outraged, too, that tenants were relocated and the buildings torn down several years ago, even though the new project has not yet finished rezoning its first phase (BC Housing argues the worn out buildings were serious health hazards and would have cost too much to remodel). Local residents also oppose the proposed building heights and densities. More Than a Roof (founded by the Mennonite community) is managing the only project built on the site thus far: City Heights is a 53-unit rental housing development for low-income, independent seniors and people with disabilities. 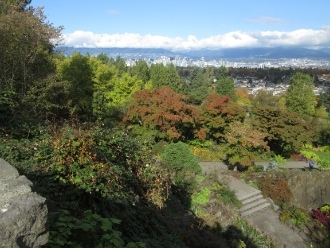 The view over the city from Queen Elizabeth Park. Green space: There is a lot of green space across the southern half of the area: Queen Elizabeth Park is bordered on the northeast by Hillcrest Park, Nat Bailey Stadium Park and Riley Park, while Mountain View Cemetery takes up a two-block wide swathe stretching for 10 blocks along the west side of Fraser Street. Shopping: Main Street, on either side of King Edward Avenue, has long hosted a lively antique trade, but now is rejuvenated as a shopping and cultural street, with a wide range of coffee shops, fashion boutiques, consignment stores and restaurants alongside the vintage trade. Fraser Street has recently been dubbed “the new Main Street,” and Cambie has also become busier as far south as King Edward, along the SkyTrain Canada Line. The Oakridge United Church property is slated for redevelopment. 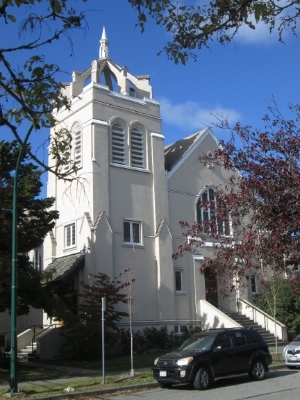 Church makeovers: Both Oakridge United Church and Oakridge Lutheran Church – on the north side of 41st Avenue, just east and west of Cambie Street, respectively – could soon undergo major redevelopment. According to an October 7 posting on Vancouvermarket.ca by “keen observer of local planning policy” David Taylor, Townline Homes has filed an application under the Cambie Corridor Plan to rezone the Oakridge United property from RS-1 to CD-1. The preliminary plan is for a new six-storey, 58-unit residential building that includes new church space. When [church] buildings close, Vancouver communities lose more than Sunday worship space; they lose space for the countless social and cultural activities that churches accommodate seven days a week. 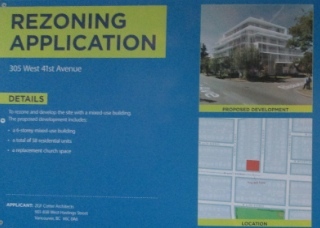 Plans for the Oakridge United Church property. For Heritage Vancouver’s full comment go here. There will be an open house at the church to discuss the plans, October 22, 5 – 8 pm. The Oakridge Lutheran Church has been considering options for a redevelopment of their prominently located property adjacent to Oakridge Mall in Vancouver. The church wishes to remain on the property, while creating a new, welcoming multi-use space, and a wider community benefit in the form of affordable housing. Catalyst and Oakridge Lutheran are entering into a joint venture agreement to develop, own and operate this mixed-use building, with a unique deal structured to achieve the objectives of both organizations. The new building will include ground-floor revenue-generating retail space, second floor multi-purpose space for use by the church and other community based organizations, and four floors of secured affordable rental housing. Cityview Baptist is a small but active church just east of Main Street at 28th Avenue. Blessed Baptist Church of Vancouver; Chinese Christian Gospel Church; Cityview Baptist; Fruitful Life Christian; Holy Cross Japanese-Canadian Anglican; Immanuel Baptist; Jesus Rock of Ages; King’s Way (The); Oakridge United; Tenth Church East Van; Vancouver Chinese Pentecostal; Vancouver Fountain Alliance; Vancouver Native Pentecostal. See map. 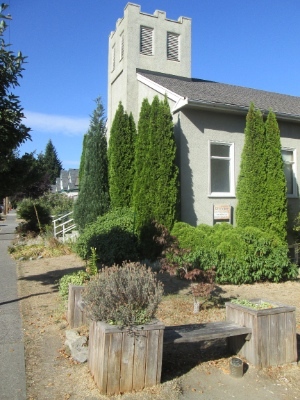 * Oakridge United Church is home to St. Giles Community Preschool and a thrift store. * Vancouver Chinese Pentecostal Church runs Sunshine Corner Day Care, and on Friday nights, through the Emerging Generations student ministry, hosts neighbourhood children. * The Courier did several articles on Riley Park as part of a year-long series of articles on Vancouver neighbourhoods in 2013/2014. * The City has a Riley Park page. Hi Anne: Thanks for the note. Cambie Street is the border between Riley Park (on the east) and South Cambie (on the west). So Chown Memorial and Chinese United is – barely – outside of Riley Park. We will feature South Cambie before too long as well.